Mexican Umami, in a hot sauce! 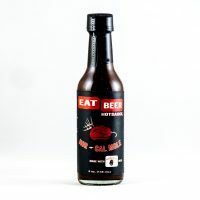 A hot chemistry, combined with zesty citrus juices, spicy euphoric (eu-fork-ic) chilies (Carolina Reaper, Habanero, Poblano and Ancho), luscious cocoa nibs, and creamy oatmeal stout beer. 48 ingredients? It makes a difference! Great as a hot sauce, ingredient, condiment and beer cocktail mixer. Check out our recipes.